From a distance, our galaxy would look like a flat spiral, some 100,000 light years across, with pockets of gas, clouds of dust, and about 400 billion stars rotating around the galaxys center. Thick dust and blinding starlight have long obscured our vision into the mysterious inner regions of the galactic center. And yet, the clues have been piling up, that something important, something strange is going on in there. Astronomers tracking stars in the center of the galaxy have found the best proof to date that black holes exist. Now, they are shooting for the first direct image of a black hole. From a distance, our galaxy would look something like this. A flat spiral, some 100,000 light years across, with pockets of gas, clouds of dust, and about 400 billion stars rotating around the galaxy’s center. That center — bulging up and out of the galactic disk — is tightly packed with stars. And yet, the clues have been piling up, that something important…something strange… is going on in there. The first to take notice was the physicist Karl Jansky back in the 1930s. He was asked by his employer, Bell Telephone Labs, to investigate sources of static that might interfere with what it saw as the killer app of its time… radio voice transmissions. Using this ungainly radio receiver… Jansky methodically scanned the airwaves. He documented thunderstorms, near and far… and another signal he could not explain. It sounded like steam — a hiss of radio noise. Jansky narrowed it to a spot in the constellation of Sagittarius, in the direction of the center of the galaxy. Located within a larger pattern of radio emissions… … Jansky’s sighting would become known as Sagittarius A*. The word of Jansky’s finding got out. He assured the public that it was not aliens seeking contact. But that’s just about all anyone could say… for over three decades. Then Erik Becklin got on the case. Becklin is one of those rare researchers whose curiosity and determination push our understanding to a whole new level. It was the 1960’s and astronomy, like society, was in a period of ferment. Startling new observations were being made… and new interpretations were in the air. Quasars had just been discovered… extremely bright beacons of light from deep space. Were they coming from the centers of distant galaxies? And what powerful objects were generating them? To study an event at the center of a galaxy, you have locate it. Young Becklin first took aim at our neighboring galaxy, Andromeda. In ultraviolet light, you can see a dense glow in the middle. Becklin found the point where the light reaches peak intensity… and marked it as the Center. From our orientation in space, all of the Andromeda galaxy is in full view. …and obtained a device that reads infrared light… whose wavelengths are similar to the distances between particles in a dust cloud, allowing them to move right through. Becklin began measuring the brightness of the light as it rose to a peak… marking the location of the galactic center. Pinpointing this site would now allow astronomers to begin probing for details with a new generation of powerful telescopes… to peer into the bright lights… the forbidden zones… deep in the heart of the Milky Way. Becklin wasn’t the only astronomer interested in the galactic center. Reinhardt Genzel, and a team based at the Max Planck Institute for Extraterrestrial Physics in Germany, began a similar campaign in 1990… from the New Technology Telescope in the mountains of Chile. Eric Becklin and colleagues, including Andrea Ghez, began using the newly christened Keck Telescope. The American and German groups shared the same goal… to pinpoint the precise location of Sagittarius A*, and find out what it is. Because the object is too small to see… at 26,000 light years away… they would study it by tracking the orbits of stars around it. 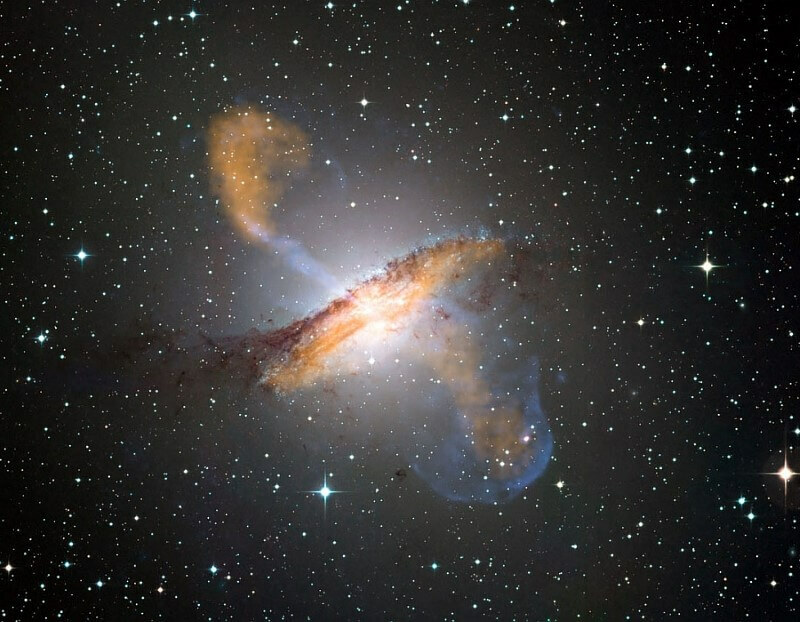 Meanwhile, using a similar technique, astronomers had focused the new Hubble Space Telescope on a different galaxy… a giant elliptical cloud of nearly a billion stars, lying some 50 million light years away called M87.